Heat oven to 400 degrees F . Spray a baking sheet (with sides) with nonstick cooking spray. Form pizza dough into a 15-inch by 10-inch rectangle (this doesn’t have to be exact, just close). Place dough onto the baking sheet and bake for 8 minutes. Spread the buffalo chicken over the pre-baked pizza crust then scatter the cheddar cheese, mozzarella cheese and half of the sliced green onions on top. Scoop a spoonful of taco mixture into clear plastic cups to use as the base of the dip, followed by a layer of each listed ingredient according to your liking. Top with extra cheese , jalapenos, olives, etc. 1 lb of ground beef is enough to make about 10 taco cups. Consider doubling the recipe if feeding a larger crowd. Cover and cook on low for 2-3 hours stirring occasionally. Cook your tater tots according to directions until golden brown in color. Once you pull them out of the oven, let cool for approximately 2-5 minutes until you can skewer them onto the skewers. I suggest 6-7 per skewer. 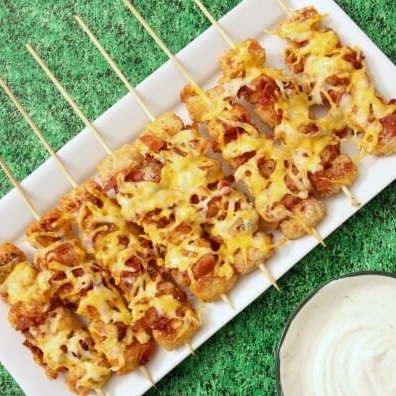 Once on the skewers and on the pan, sprinkle ranch dressing over each of tater tots. Then sprinkle the bacon and then the cheese. Into the oven for an additional 10 minutes until the cheese is fully melted and golden in color.